THE crisis between the Olubadan of Ibadan land , His Majesty Saliu Adetunji and his colleagues took another dimension on Monday as the ten Ibadan High Chiefs promoted to the position of Obas by the Oyo State Governor Senator Abiola Ajimobi have formally announced that they have suspended the payment of Olubadan salary from their respective councils . According to the laid down procedures, the ten former high chiefs but now Obas were the paramount rulers of the ten local government councils of Ibadan land, except the Southwest local government council which High Chief Rasidi Ladoja is the Paramount ruler who is backing Olubadan . Rising from three hours meeting yesterday the traditional rulers declared that they have suspended the payment of Oba Adetunji’s salary of N200,000 each from the eleven local governments until further notice. Speaking to the newsmen on behalf of the Obas , Oba Olalekan Balogun declared that “it is unfortunate that they just have to suspend the payment of Kabiyesi Adetunji for him to realise that he did not have absolute powers on the issues of Ibadan land. We are addressing you media men telling you the true pictures so that nobody will point accusing fingers to the civil servants in the local government councils. “The Olubadan had refused to call Olubadan- in- council meeting since we have been promoted to Obas by the governor, saying that he not call the meeting unless we drop our new titles to the former ones. Whereas Olubadan did not reject his own promotion ‘’. “Also, we are tired with the ways Baba Olubadan is installing the mogajis and other titles in Ibadan. Recently, Baba Olubadan installed three as mogajis in Kosodo and two person as mogaji Ile Asa all in Ibadan. This action is against the tradition of Ibadanland and we cannot allow this to continue . “We are addressing you gentlemen of the media so that you can help us diseminate this message to the general public ,and ,we want to shift blames from the civil servants working in ten councils. We don’t want anybody to punish them. So we are for the suspension and until he recognizes us no salary for him in ten local governments in Ibadan again.”. 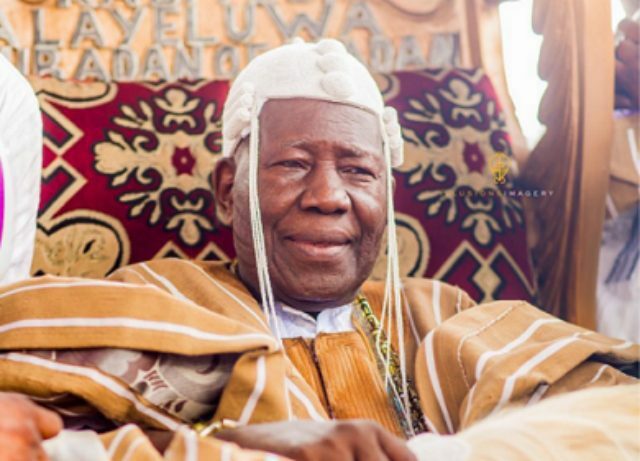 Also, while corroborating the position of Oba Lekan Balogun, the Balogun of Ibadan land Oba Owolabi Olakulehin said Olubadan does not have absolute powers. ‘’For example he lacks power to order the suspension of Chief Ojeniyi Akintomide Okugbaja ,the Alagbaa Isale Osun Oranyan because he allowed masquerades to pay us homage during the last month egungun festival .Paying homage to some of us is right which is annually done. How can he now say they should visit us? Anyway we have overruled him and nullified that letter of suspension because he must consult with us in the council before taken such decision.